Is Pregnancy a Risk Factor for Future Cardiovascular Events? Pregnancy is a normal physiologic state in a woman's life, and according to traditional beliefs, it may not be predictive of future cardiovascular disease (CVD) lest it is complicated by some adverse events. Contrary to the previous beliefs, the complications are not limited to pregnancy period and may leave permanent vascular and metabolic damage. Factors such as lipid inflammatory pathways and vascular functions play a vital role in determining the cardiovascular risk in pregnancy. In addition to modifiable and nonmodifiable risk factors, emerging factors like genetics and epigenetics risk, obesity, metabolic syndrome, lifestyle, inflammatory and hypertensive disorders, and endothelial dysfunction with gestational diabetes help in determining the future CVD. 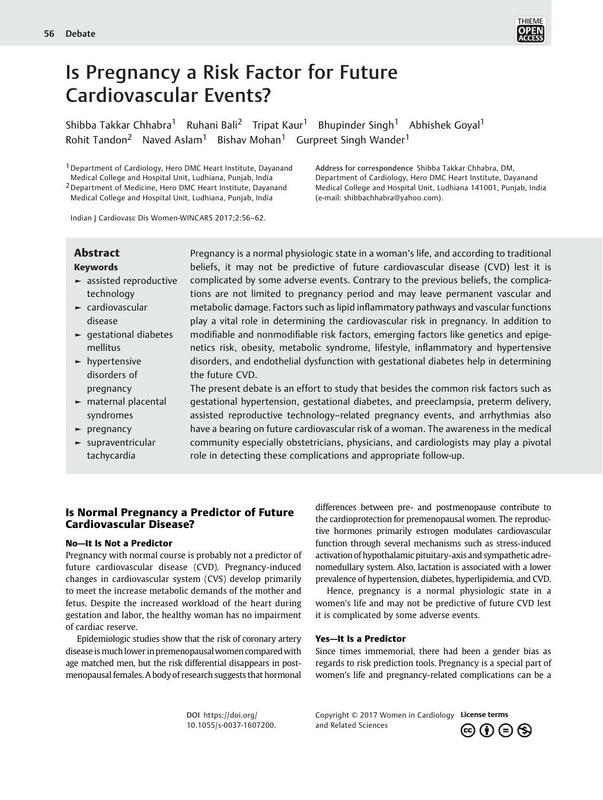 The present debate is an effort to study that besides the common risk factors such as gestational hypertension, gestational diabetes, and preeclampsia, preterm delivery, assisted reproductive technology–related pregnancy events, and arrhythmias also have a bearing on future cardiovascular risk of a woman. The awareness in the medical community especially obstetricians, physicians, and cardiologists may play a pivotal role in detecting these complications and appropriate follow-up.